Business partners Manfred Dohmen and Theo Aerts were the driving force behind the construction of the Millennium golf complex in the late 1990s and they built the course on the site of what was once an old peat bog in the province of Limburg. 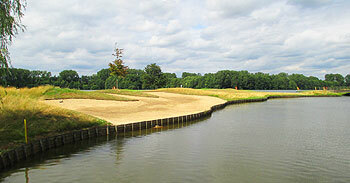 Laid out on a largely flat and open landscape, with only a few isolated stands of oak and beech trees dotted around the property, the eighteen fairways at Millennium have been expertly routed around Lake Paalse, with its shimmering waters assimilated into the design at holes 3, 7, 8 and 9 on the front nine and at the opening and closing hole of the back nine. The Millennium golf course measures almost 7,000 yards from the back markers and it’s been used by the Belgian PGA to test its professionals a number of times in recent years, most notably when the PGA Masters event was held here in 2011. Ably supported by the 9-hole “Compact” course, 6-hole “Bambini” layout and a two-tier driving range, the Championship course at Millennium is the main component of a modern, progressive golf facility which appears to have all the necessary attributes for it to become one of the nation’s top tracks. Architect Bruno Steensels has imported a real flavour of Florida to the heartland of Belgium with this new millennium track. In routing many of the fairways around water and brashly placing a number of eye-catching waste bunkers around the property, the designer has brought more than a modicum of the Sunshine State’s golfing feel good factor to the Championship course. Most of the aquatic challenge takes place on the front nine, where the 162-metre 8th hole, “Fly Dry,” is rated stroke index 1 - I don’t think I’ve ever played a course where a par three has been rated the toughest on the card! On the back nine, the 325-metre 13th, “Desert Split,” is a cracking short par four, with a fairway that forks at the landing area, offering a choice of approach to a raised green which is partially hidden behind a huge expanse of sand and shaggy grass mounds. This place might not suit older, more traditionally minded golfers as it’s a very modern set up, complemented off the course by state of the art facilities in and around the clubhouse -- I suppose it’s fair to say it’s where the game is at nowadays for golfers in the new millennium and I won’t be surprised if the course breaks into the national top 10 chart when it’s next re-ranked.